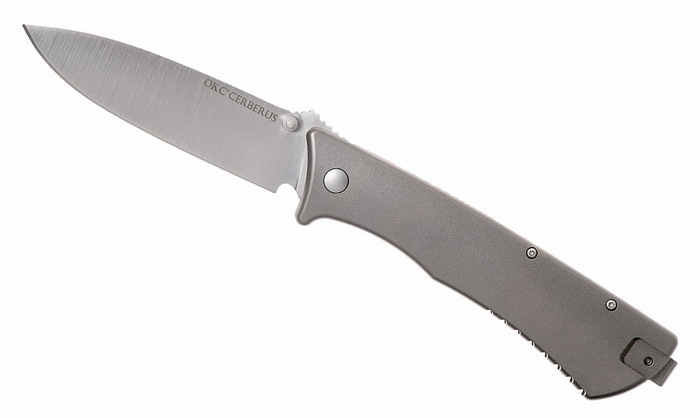 The OKC Cerberus Folder features a functional heavy-duty build in a minimalist design. Its durable titanium frame lock handle offers an excellent grip with a tapered profile and notched contouring. The Cerbers Folder's robust drop point blade is made from D2 tool steel with a satin finish and dual thumb stud openers. A reversible pocket clip accommodates tip-up, right or left side carry.